It's taken me a while to get back to painting...lots going on. But I am excited! I have four small works in progress and hope to finish this one tonight. 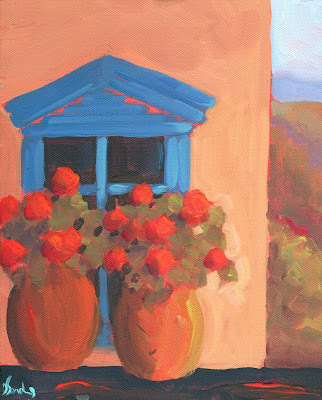 It's a couple of lovely geranium pots in front of a Canyon Road window in Santa Fe. Stay tuned and thanks for being patient.